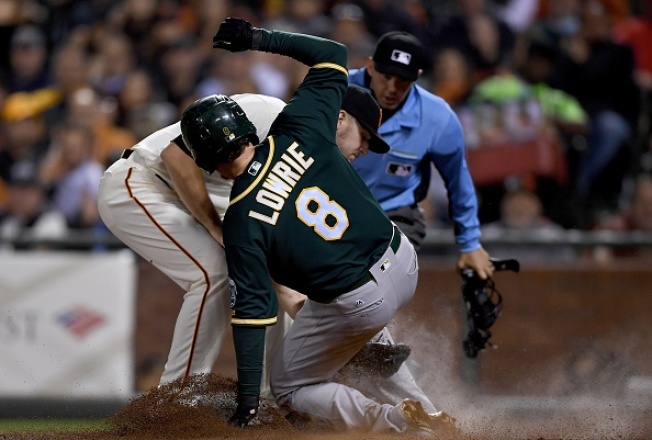 SAN FRANCISCO — Jeff Samardzija set the side down in order four of the first five innings Monday night, which made the second inning all the more maddening. Samardzija gave up five runs in his second frame, and that was that. The Giants would never recover, losing 8-3 on a night when rookie Daniel Mengden flummoxed them. Mengden picked up his first career win. Samardzija, who won seven of his first 10 Giants starts, was left wondering how he can find the consistency to be that guy again. Samardzija finished with a 6.69 ERA in six June starts, but the stretch includes a dominant four-hit complete game in Tampa Bay. It’s nights like those, and innings like the first, third, fourth and fifth on Monday that show Samardzija he’s not fatigued or a mechanical mess. He said the issue is mental. The big one was a two-strike slider in the second that Marcus Semien blasted for a three-run shot. Samardzija was kicking himself for missing over the heart of the plate. “If anything, you miss in the other batter’s box,” he said, noting that he should have lived to come back and get Semien on the next pitch. That was the theme of Samardzija’s night. He knows what he has to do, and he had a laundry list after his fifth loss of the season: Get your off-speed pitches in the strike zone and your two-strike pitches out of the zone … “relax and trust your stuff” … get the slider “where I need it to be.” Samardzija simply couldn’t check any of the boxes on a consistent basis.